I know this isn’t the first time I have written about overthinking and with my mind it definitely won’t be the last but it is something I have spent a lot of time thinking about in the last couple of days. Just now I have come to a conclusion which might really be able to help you if you’re an over-thinker too. 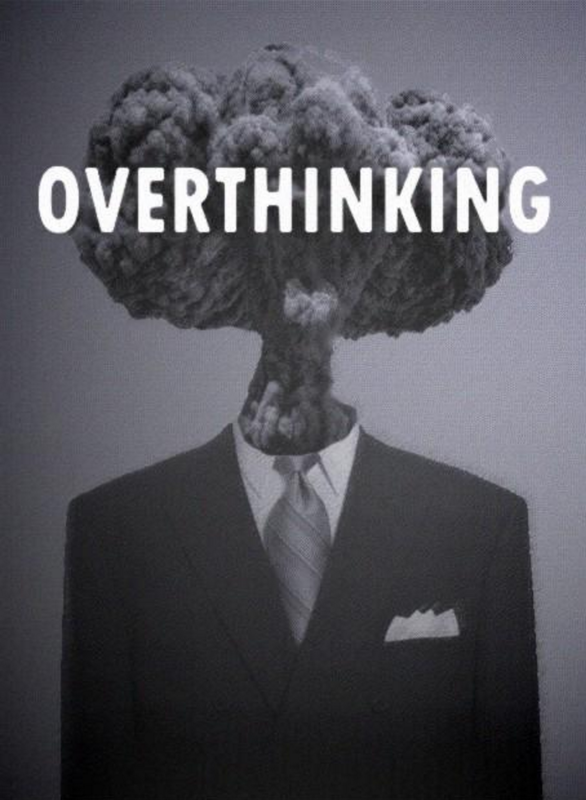 Over thinking stems from insecurities. You’re always thinking the worse, you’re wondering what someone else is thinking and deep down you just really want some form of validation. While it is nice to have validation it’s even more important to be yourself. People should be able to accept and love you for who you are. Yes I know what you’re thinking that easier said than done but that can be said for almost anything in life. Eventually you’re going to have to have that difficult talk, apply for that new job, move countries or start that new venture. It’s not something you should be nervous about or even overthink. The worst that can happen is someone says no and you go back to the drawing board, get the training you need to improve and re-apply yourself to what ever it is you were gunning for. Don’t loose hope and don’t be down on yourself. Everything happens for a reason and maybe a better opportunity is just around the corner. Optimism is one of the most beautiful things in a person. Think about when you hang out with your friends how often do you think about them being in a negative mood and wanting to hang out with them. Obviously no one is happy 100% of the time but an optimistic mind is more likely to be happy than always focusing on the negatives. We’ve all got dreams that we want to achieve and one day you’ll meet someone who is willing to help you achieve those dreams don’t be afraid of some light teething issues. Every relationship starts out magically it’s totally normal for there to be some speed bumps. Be patient, be kind and don’t overthink the situation. Remember you are good enough. Your past might not be as pure as how you want your future to be but at least you have experience with what a good relationship isn’t. It’s important to know right form wrong and walk towards a positive future. Working through issues with that special someone will bring you closer together and make you want to spend more time with them. Working to sort out your issues will only help you understand each other and elongate the life of your relationship. Don’t be afraid to say sorry when you’re in the wrong, but don’t apologise too often because eventually words loose their meaning when they’re said too often. Lately I’ve started noticing when I am over thinking something and I pull myself up on it. For a minute I think about the logical scenarios and then I remember that thinking about the logical scenarios isn’t actually going to help it just leads me down another road of overthinking everything. I think the best thing to do when you’re over thinking is to speak to who ever it involves. Be open, honest and rational. A problem shared is a problem halved and a problem halved is the difference between overthinking something and not. The hardest part of overthinking is knowing you’re only thinking about it because you care about what ever it is. Obviously that thing, person or issue is something you’re passionate about, it’s something that means a lot to you, it’s difficult and you don’t want to risk loosing it. Do what you can to ease the pain. Spend time with people who lift you up. Ensure you have lots of hobbies to take your mind off the situation and most importantly have fun. We’ve only got one life to live lets make the most of it. This is a new week. It’s a new opportunity. It’s a chance for you to fix your wrongs write the next chapter keeping in mind everything you have learned in past experiences. Never underestimate your determination and passion. You’ve got what it takes to make this amazing. Now go get it! Great post. Now, stop thinking about it so much, go out and have a fantastic week! A frame of mind I am presently in! Yes, gone with the wind!